This stunning and equally modern luxury Villa in Clifton has everything you could ever need for a memorable stay in the Mother City. It features 4 elegant en-suite bedrooms and balconies that show off the very best of the beautiful Clifton and the Mother City alike. The spectacular view of the Atlantic Ocean and mountainous backdrop will be enough to make you never want to leave again. Known for its striking beaches, vibrant energy and trendy hangouts, Clifton offers you the best of everything, and you’ll be right there enjoying every second of it in your beautiful luxury villa! Arguably the most luxurious Rental Villa on offer in Southern Africa, the Pentagon is an architectural masterpiece and a Cape Town dream come true. This magnificent 5 bedroom Clifton villa is the epitome of luxury. With impeccable detail, sensational design and unobstructed panoramic views of Clifton’s 4 famous beaches and the striking Atlantic, the Pentagon is a true work of luxurious art. Nestled in the heart of the unique enclave of Lions Head Nature Reserve, this contemporary villa has everything you could ever need. Beautifully designed open living spaces, lavish bedrooms, sumptuous private den, a stunning rim flow private pool, luscious Zen-like garden with a trickling waterfall, boxing/dance studio and SO much more! This prime Cape Town location means restaurants, trendy hangouts, the beach and everything you’ll need on your stay in the Mother City is within reach. There is a very good reason why this villa was voted the best in Cape Town, and now it can be yours! 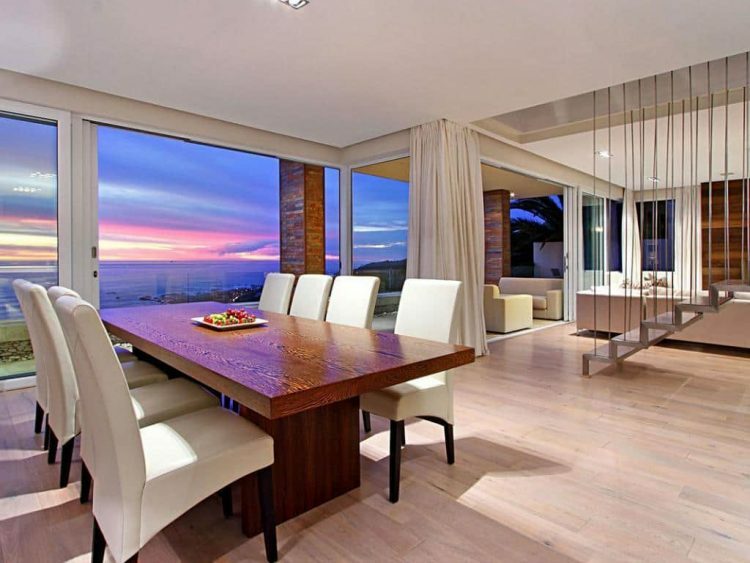 The beautiful and vibrant Camps Bay is where you’ll find this truly dazzling, 5-star, ultra-modern villa. Boasting a flawless contemporary design, the Modern Hideaway is guaranteed to wow you with its modern touches and open plan flow. 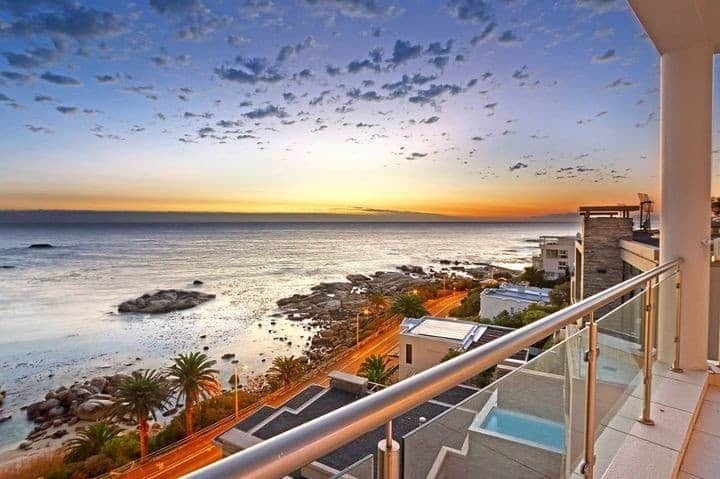 Offering 6 bedrooms and 6 bathrooms (sleeps 12 people), this Camps Bay luxury property is the perfect entertainment hotspot or hub of relaxation, the choice is yours. It boasts spectacular views of the Atlantic and mountain ranges, a contemporary swimming pool, jacuzzi, garden, several balconies to soak of all the Mother City bliss and so much more! 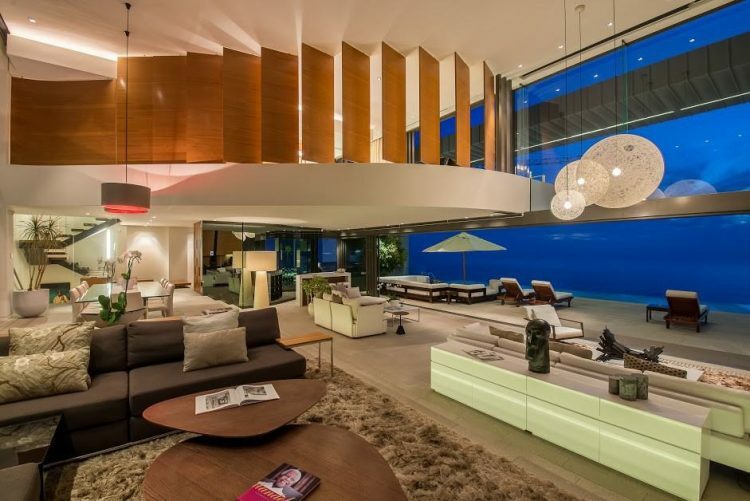 Prime positioning, spectacular ocean views, chic architecture, stylish luxury and a list of incredible amenities is just some of what the Oceana Villa situated in the stunning Clifton has in store for you! This luxury villa boasts 4 spacious en-suite bedrooms, all with a full 180 degree ocean view, luxury spa, full home cinema, equipped gym, private pool and many more thrilling surprises. 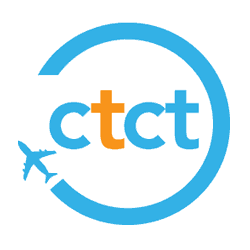 And being just a stone’s throw away from one of the most beautiful beaches in the world, as well as some of Cape Town’s trendiest hangouts, ensures you have everything you need for a sensational holiday in the Mother City. Luxus house is a true Clifton stunner! Situated in the serene picturesque region of Clifton, Luxus House is an exclusive villa that offers a superbly appointed designer home with 270° sweeping ocean views. It boasts 5 luxury en-suite bedrooms and its beautiful floor to ceiling open plan living space is flooded with warm natural light and sensational Cape Town views. This makes it the perfect space for entertaining friends and family or an incredible holiday home for your time spent in the Mother City. 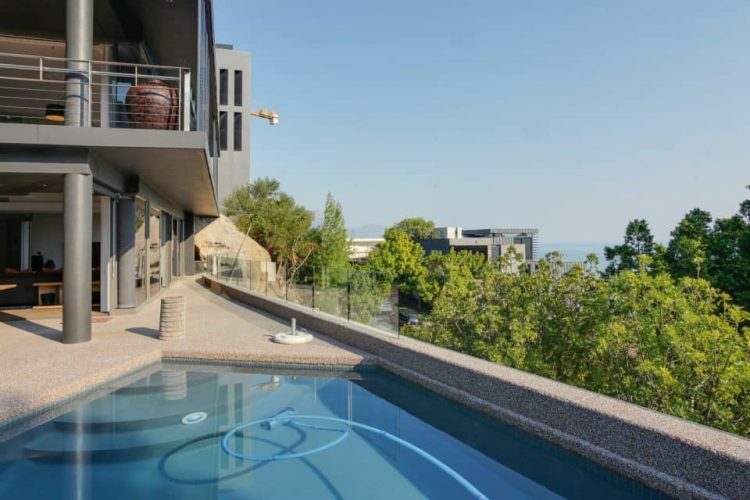 The private pool, abundance of additional amenities and close proximity to Clifton makes Luxus house the perfect luxury rental choice for your Cape holiday or luxury breakaway! Nestled against the slopes of Table Mountain’s Lion’s Head you’ll find this 5 bedroom intimate, yet modern, Cape Town property gem! This spacious residence offers three exclusive suites as well as a spectacular penthouse that boasts truly unrivalled views of the famous Twelve Apostles mountain range and the striking Atlantic Ocean. This elegant ocean side mansion has so much to offer and it’s modern yet antique ensemble creates a truly enchanting space and the best combination of elegant European opulence and chic African flare. Its serene landscape, attractive decor, private decks, swimming pool and beautiful gardens also allow guests to enjoy all the incredible privacy and serenity this stunning Clifton residence has to offer. Situated a mere 5 minute walk from the famous Camps Bay sunset strip, this luxury 5 bedroom villa is chic, stylish and equipped with everything you could ever want and need for a luxurious and relaxing holiday in the Mother City. And it isn’t called the Cape Sunset for no reason, watching the Cape Town sunset from one of its terraces will be a truly incredible experience to say the least. It’s private pool, prime location and being walking distance from the beach just adds that extra special touch to make your stay in the Cape Sunset truly memorable! 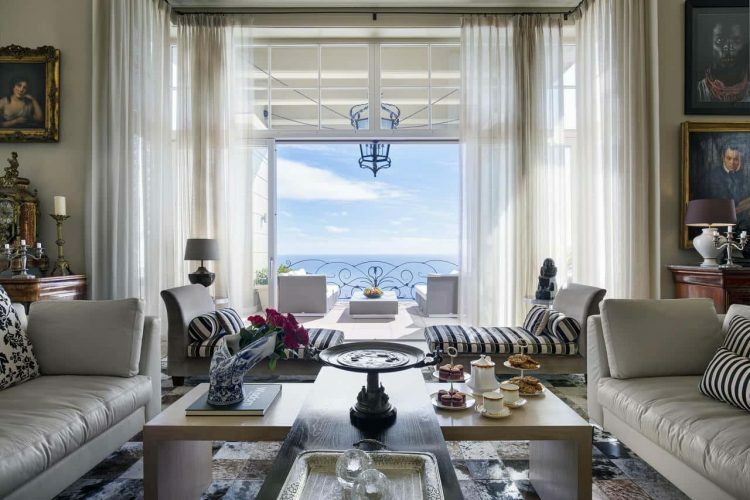 This truly mesmerising 5-star, ocean facing villa in Camps Bay is the perfect luxury destination for a holiday spent soaking up all the beauty of the Mother City. 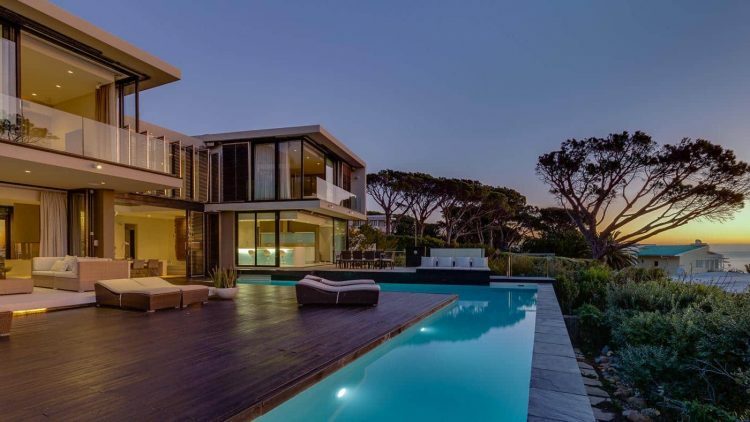 Boasting 5 bedrooms across 3 levels of elegance, a contemporary open plan living space as well as an ocean facing pool equipped with stylish sun loungers, this Camps Bay villa takes Cape Town summer time bliss to a whole new level. 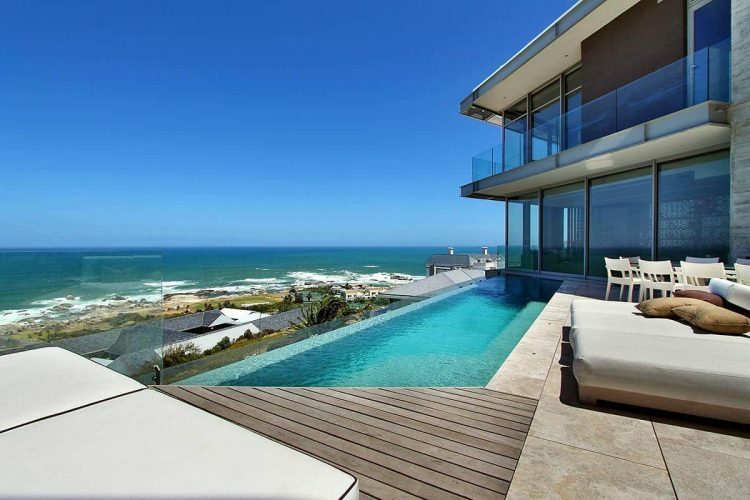 This, combined with its prime positioning mere minutes away from one of the most magnificent and vibrant beaches in the world, as well as a strip of trendy hangouts and sunset cocktail spots and restaurants, makes Villa Felicity the perfect choice for a group of people looking to have the summer of their lives in Cape Town! These beautiful luxury rentals will not only make sure your stay in Cape Town is filled with chic elegance, stylish luxury and modern comfort, but an extra touch of Mother City magic. The sensational views of some of the most iconic Cape Town landmarks and access to the most beautiful beaches and trendiest hangouts in the Mother City is something truly spectacular, and who knows, you might never want to leave again! Still not sure where you want to stay in Cape Town this holiday season? Browse our Curated Collection to view even more incredible choices for luxury accommodation in Cape Town. This collection includes some of our most sought-after apartments and villas across the city’s top destinations. You can also contact us for assistance in finding the very finest selection of luxury accommodation in Cape Town.